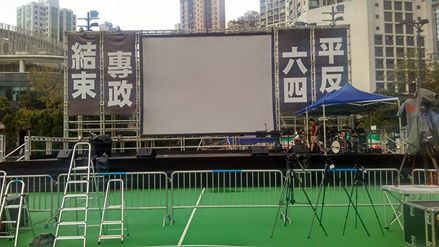 It was less than a month ago when citizens wrestled with the dilemma of whether to take part in the Tiananmen candlelight vigil at Victoria Park. Naysayers argued that the annual ritual, in its 28th iteration this year, had devolved into a night of sing-along and group therapy, as well as a thinly-veiled excuse for political parties to hit up participants for money. Those arguments had traction, especially among the youth, and many chose to stay home on June 4th. The turnout was the lowest in years. Call it the Vic Park déjà vu. Three weeks after the raucous Tiananmen debate, Hong Kongers once again find themselves ruminating over yet another “should I stay or should I go” decision, this time about the July 1st march. 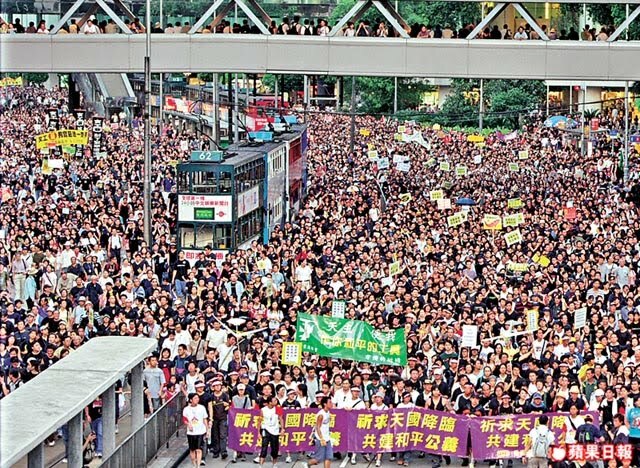 In Hong Kong, taking to the streets on Handover Day has been something of a tradition. The march typically begins at Victoria Park, inches down Hennessy Road and finishes at the government headquarters. It is an annual outing for the public to vent their anger over a host of political and social issues, from the call for universal suffrage to the withdrawal of bad government bills and the protection of a free press. Over the years, the Handover Day protest has taken on a carnival atmosphere. The entire westbound Hennessy Road and Queensway from Causeway Bay to Admiralty are turned into a pedestrian zone. Opposition political parties and advocacy groups set up colourful fund-raising booths along the route, handing out paper fans and selling paraphernalia. As a result, the march shares many of the same criticisms levelled against the Tiananmen vigil. This year, with C.Y Leung out of the picture and chief executive elect Carrie Lam yet to reveal what kind of villain she will be, march organizers are struggling to find a cause célèbre to fire up the public. A good turnout looks doubtful. So in case you need a nudge to get off the couch and head over to Victoria Park on Handover Day, here are a few reasons why you should. First, when it comes to large-scale demonstrations, numbers speak and size matters. In Hong Kong, protester turnout is one of the most reliable and closely watched barometers of public sentiment, which is why the police routinely underreports the numbers to downplay dissatisfaction toward the government. 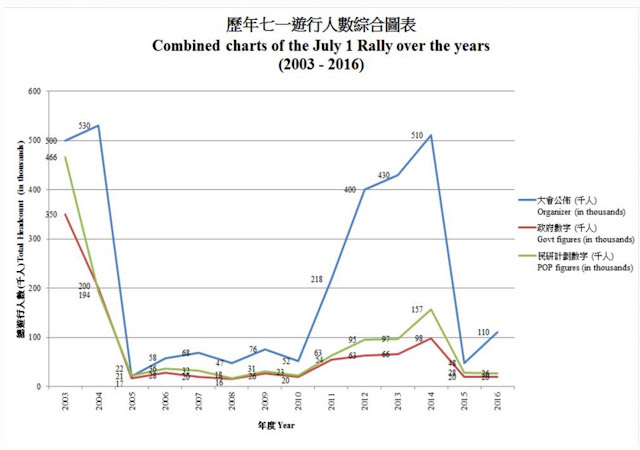 Since the handover, big rallies have resulted in major concessions from the authorities, most notably in 2003 when half a million citizens forced then chief executive Tung Chee-hwa to withdraw an anti-subversion bill, and in 2012 when 120,000 parents and students staged a sit-in in Tamar to thwart a patriotic education curriculum. A strong showing on this Handover Day will deliver a clear message to Carrie Lam that we are here to hold her and her rogue gallery of unpopular cabinet members to account. A low turnout, on the other hand, will give Lam plenty of bragging rights in front of her bosses up north. Second, it is often said that a right not exercised is a right lost. 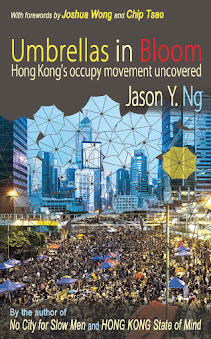 Already, civil liberties in Hong Kong have been under threat on all fronts, from press and academic freedoms to the freedom to publish and protest. This year, the Victoria Park football pitches—the traditional starting point for the July 1st march—have been “pre-booked” for pro-Beijing celebrations, forcing marchers to convene on the nearby lawn, which may cause confusion and potential run-ins with the Chinese flag-waving revelers. Similarly, the Tsim Sha Tsui clock tower, a popular meeting place where the fringe localist group Hong Kong National Party has planned a vigil on June 30th, is suddenly off limits due to “public maintenance works.” If we choose to self-censor by staying home on Handover Day, we may be complicit in the government’s effort to curtail our constitutionally protected right of assembly. Third and most importantly, this year marks the 20th anniversary of the handover and President Xi Jinping is expected to grace us with his presence. The entire foreign press corps will descend on the city to cover the pomp and circumstance. What better occasion is there for Hong Kongers to make maximum noise and draw maximum attention to our grievances and demands? With the help of law enforcement, our government is determined to turn Xi’s visit into a tightly-controlled, Pyongyang-style tour by locking down large swaths of the city to keep out pesky protesters and filling the streets with minders and rent-a-crowds. 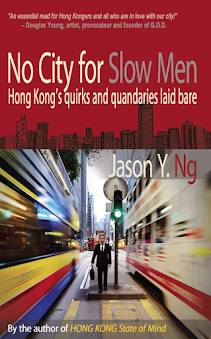 We don’t need another North Korea, and we owe it to ourselves to show the Paramount Leader the real Hong Kong—one that our ruling elite don’t want their top boss to see. If none of these reasons are enough to persuade you to join the march, then consider this: if Carrie Lam has her way and passes an anti-subversion bill within her first term, we might not, by the time the next milestone anniversary rolls around, have a chance to march down Hennessy Road chanting anti-Beijing slogans without risking arrest and prison. So enjoy your right while you still can. The rally begins next Saturday at 3:00 pm from the Victoria Park lawn. 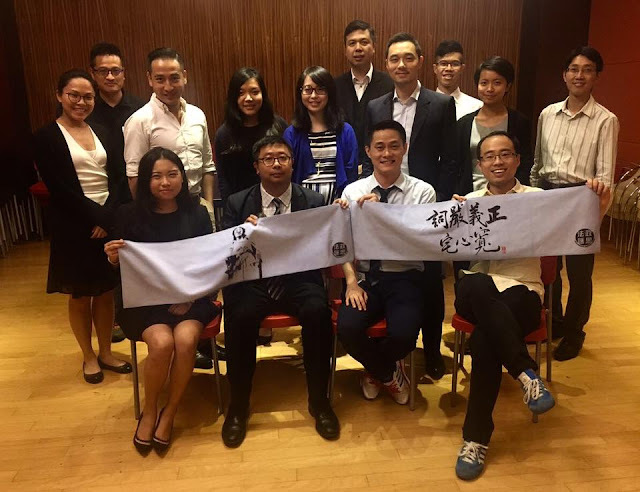 March with the Progressive Lawyers Group (法政匯思) or look for their booth on the intersection of Hennessy Road and Tin Lok Lane (天樂里). March with the Progressive Lawyers Group! 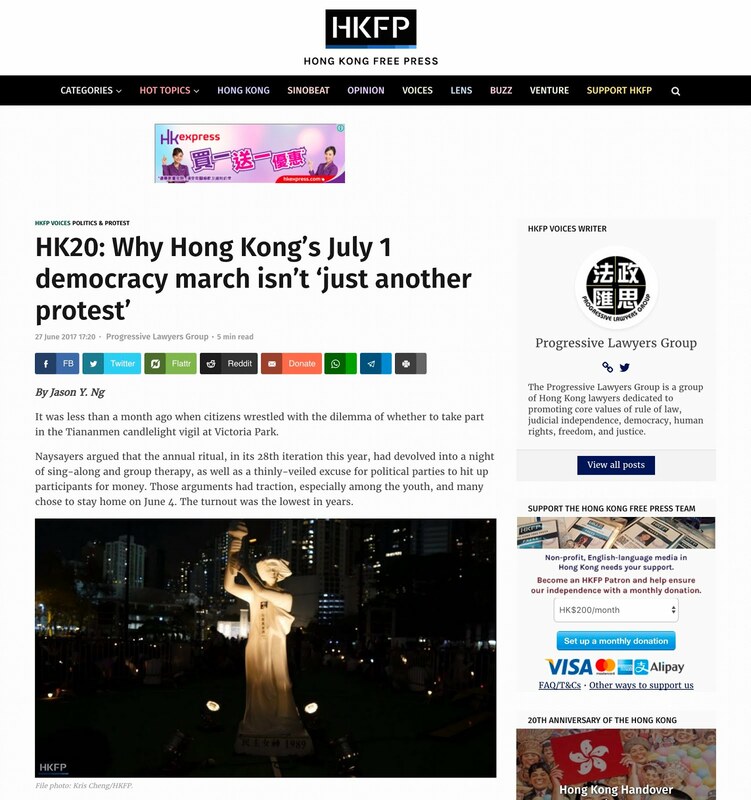 This article appeared on Hong Kong Free Press under the title “Why Hong Kong's July 1 Democracy March isn't 'just another protest'."